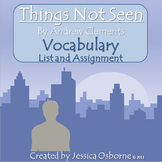 Things Not Seen by Clements, Novel Unit: Vocab, Questions, Projects, and MORE! A set of short answer comprehension questions and test for the book, "Things Not Seen". There are 18 pages total. The chapters are grouped into sets. *This is also included in the larger literature unit on sale for $9.99. 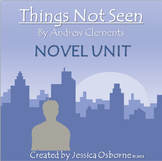 A modified test for the novel Things Not Seen, 25 questions. I used this with an 8th grade special education class. The students loved the book. Things Not Seen by Clements ch 1-11 questions & figurative lang. This book has TONS of figurative language. I ask the kids to search in the first 11 chapters for similes, metaphors, and personification and chart them on the second page of this worksheet. The first side has two extended response higher level thinking questions. 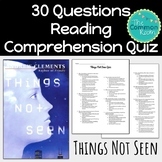 A three page packet to be used while reading the book, "Things Not Seen", by Andrew Clements. Students must determine the role, motivation, and impact 10 characters. There are also questions to answer at the end. *This is also included within the larger unit for sale for $9.99. 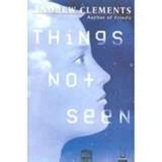 A set of 12 project challenges for the book, "Things Not Seen", by Andrew Clements. 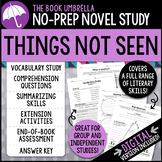 These are designed for students to extend the book by completing a variety of creative research and writing projects. *This is also included in the larger lit unit sold separately for $9.99. An easy to use table for finding the main idea of each chapter by using the chapter titles. There are 5 total pages as well as questions to answer at the end of the table. *This is also included in the larger lit unit for sale separately for $9.99. An easy to use packet for many of the vocabulary words found in the book, "Things Not Seen", by Andrew Clements. There are also blank pages for students to use to add additional words. There is a list of word locations, too. *This is also included in a larger lit unit sold separately for $9.99. 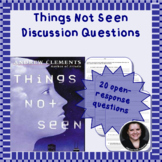 A set of 40 Battle of the Books questions for the book, "Things Not Seen", by Andrew Clements. There are 20, "In the book...", questions with answers and there are 20, "In which book...", questions with answers. All are on an easy to use card format. Ready to print and pass out to the students. I had an inclination that some of my students were not reading the book as we were doing literature circles and discussed daily. This is a basic recall quiz over the material in ch. 18 & 19.